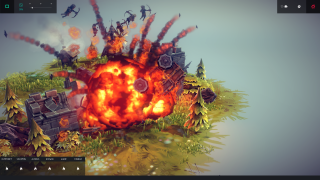 Besiege is a game about building medieval siege weapons then destroying things with them. Even at this early alpha stage it’s a madly addictive physics sandbox with a powerful editor. The community has been coming up with some incredible, mind-blowing stuff, and I’ve had as much fun watching videos and gifs of their creations as I have playing the game myself. Here are some of my favourites. P.S. I’m pretty sure these are all attributed to the right people, but if I’ve credited your creation to someone who just reposted it, let me know and I’ll fix it.